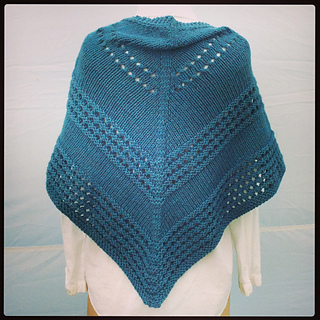 This is a soft, squishy and very cozy shawl perfect for cool autumn or spring evenings and morning strolls. 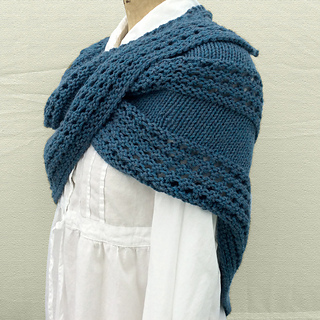 Worked in any worsted weight yarn on size U.S. 10.5 circular needles it is easy, economical, and very relaxing to knit. The pattern utilizes Stockinette stitch and an easy, elegant eyelet stitch pattern I created specifically for this pattern. 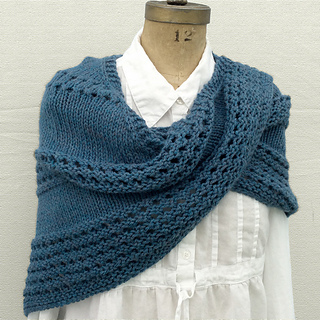 This piece does not require constant focus in order to knit it well. It is designed instead to be a pleasant knit while enjoying time with family or some other kind of entertainment. No charts are needed, the stitch patterns involved are very easy to understand and work. 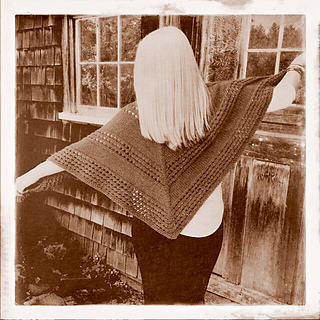 Use any worsted weight yarn for this shawl, and enjoy yourself as you knit along with my very easy to follow and understand directions.